The many colours displayed by amphibians has amazed scientists for centuries. During my honours research (Kindermann et al. 2013). 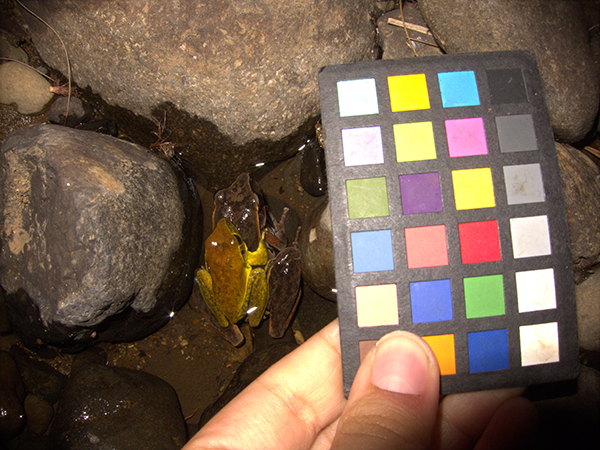 I became fascinated by the rapid colour changes displayed by stony creek frogs (Litoria wilcoxii) and eventually came to research the physiology and function of it for my PhD. Male stony creek frogs turn bright yellow within 5 minutes during amplexus (mating) in order to let other males know that they have the girl (Article in review). 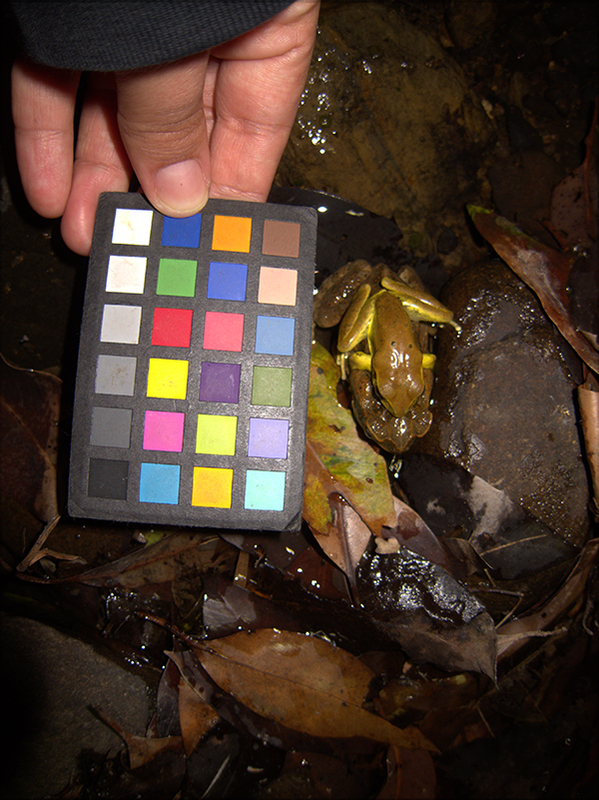 One of the main challenges I had to overcome was how to measure colour without handling the frogs (as this would affect their skin colour). Photography was the obvious answer however there had to be a way to standardize all the images. This is where Munsell came into the picture. 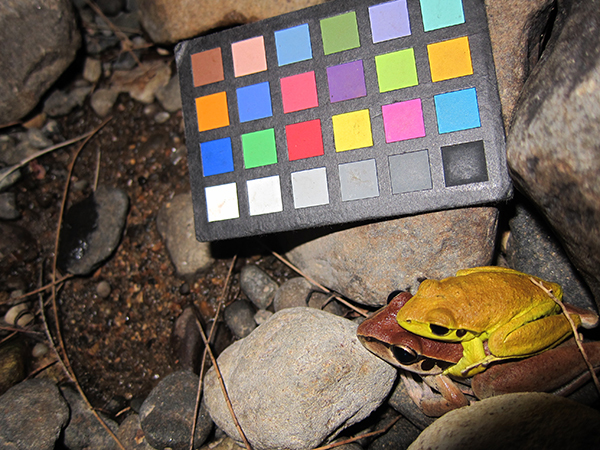 A 24 ColorChecker Chart was easy to carry around and place next to frogs wherever I found them without causing too much disturbance. This became even more useful when I was measuring colour change in mating pairs (Kindermann et al. 2014). 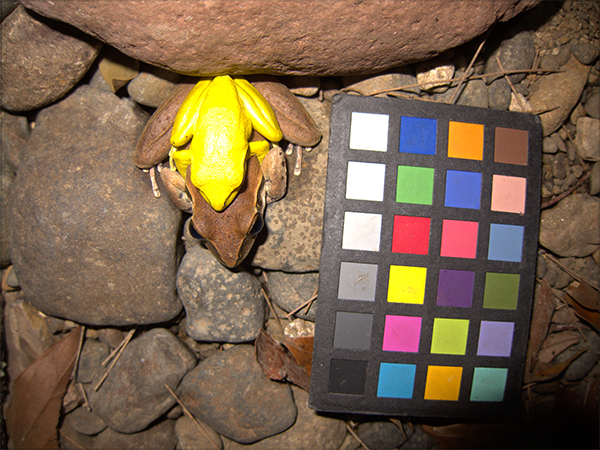 Each photo now contained the frog and the 24 ColorChecker Chart which allowed me demonstrate the similarity of exposure between photographs, and allow calibration if there were any differences. 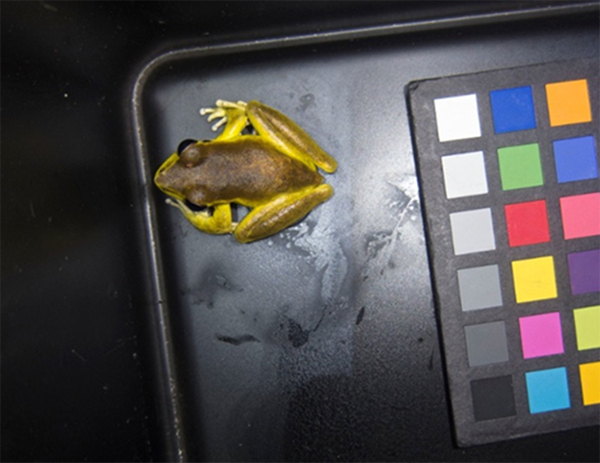 With the help of such simple technology I was able to find out about the natural timing, hormonal processes and evolutiory mechanisms of colour change in a unique Australian frog. Kindermann C, Narayan EJ, Hero J-M. 2014. The Neuro-Hormonal Control of Rapid Dynamic Skin Colour Change in an Amphibian during Amplexus. PloS one 9: e114120. Kindermann C, Hero J-M. 2016. 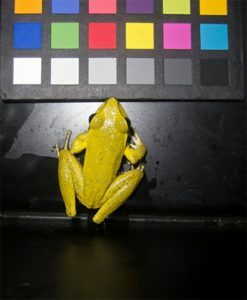 Pigment cell distribution in a rapid colour changing amphibian (Litoria wilcoxii). Zoomorphology 135: 197-203. Kindermann C and Hero J-M (2016) Rapid dynamic colour change is an intrasexual signal in a lek breeding frog (Litoria wilcoxii), Behavioral Ecology and Sociobiology. Accepted Manuscript. 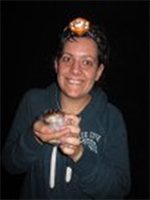 Christina Kindermann has just completed her PhD at Griffith University, Australia and is currently working as a research assistant managing some small conservation projects. She is passionate about conservation in particular understanding more about animals especially amphibians.